How much fun will FeriaSCSC be? ¡Súper divertida! Your students will have the chance to meet other students who are as interested in learning Spanish as they are, and to see first-hand that there is value in and recognition for the work that they are doing. Our students are amazing, and they deserve the opportunity to show off their talents and to be recognized for the work that they are doing. Teachers can meet up with other teachers, learn from each other, and form connections to improve their own teaching and their professional networks! Come enjoy friendly competition, the chance to practice your language, a fun Amazing Race-style game for the students, and USC’s beautiful campus! Do you want to come to FeriaSCSC with your students, but you’re just not sure? Read below to see if we can help with some common concerns—and get you and your start students to Columbia in April to celebrate their hard work and talent!! I don’t have 16 students to bring. Not to worry! Sixteen students is the maximum you are allowed to bring; you are welcome and encouraged to bring smaller teams if that’s what works best for you. We had teams of 1, 3, and 4 last year, plus two much larger teams. Every size team is just fine! You could also consider bringing a small group of students from different schools within a single school district to compete as a district team. I don’t know if my students are ready to compete against other students. We don’t have a lot of native speakers or high-level students. Students are competing against themselves (With the exception of the Spelling Bee. ): they are working to earn the highest rank possible in their own level and category; they are not competing against the other students, and especially are not being pitted against students at higher levels and with vastly different language knowledge and experience. They can compete again next year and try to beat themselves! I don’t know how to prepare my students; they’ve never done anything like this before. Head over to our FeriaSCSC website to get some tips and tricks(https://feriascsc.org/tips-tricks/) to prepare! This is still a new competition, so everyone will be new to it and no one will have an advantage. Remember that all possible prompts and the rubrics for writing and speaking competitions are available on that website, as well as the list of spelling words. Last year was so much fun, and it was so heartening to see so many students who have a passion for the Spanish language! Bring your kids and let them see that there are other students like them–who love the language and want to excel–and that we are a force to be reckoned with! FeriaSCSC 2018 was great–and we are looking forward to this year, too! As a veteran World Language teacher in South Carolina, I was thrilled to find out that our state chapter of AATSP was sponsoring and organizing a statewide competition for Spanish students. I had participated in other competitions over the years, such as National Spanish Exam and the Declamation contest at Clemson, but was really excited about the format of this event and the opportunity for students at all levels to compete. This contest had several events from which to choose: Impromptu Speaking, Spelling Bee, and Timed Writing. Students at every level of Spanish could participate in each event. Schools could bring teams consisting of up to 16 students. Because of the time of year and a number of conflicts, I was only able to bring four students, but we had an amazing day. To prepare for the competition, lists of possible topics/spelling words were provided for each level on the FeriaSCSC website. (Even if you don’t choose to participate in the competition, these are really useful resources!) The online registration process was very easy as well. The registration fee was reasonable and the venue was excellent. The day of the competition, my students and I loaded up in my car and drove to Columbia. The check in was well-organized and we had a little time to explore the campus at USC before our events began. Students were given a cash card for their lunch as well as all the information they needed for the day. I was very impressed with the schedule and running of the events throughout the day. There was also an “Amazing Race” style scavenger hunt that my students thoroughly enjoyed. At the conclusion of competition, there was a nice awards ceremony outside on the horseshoe because it was such a beautiful day. The students were all very supportive of each other’s achievements and seemed genuinely happy for each other. Overall, it was an extremely rewarding experience and I hope to be able to take a full team this year. Learn more about FeriaSCSC 2019 by visiting our webpage, www.feriascsc.org. Hope to see you there this year! I can barely believe that 2018 has come and gone, and with it went my time as your AATSPSC president. I have so enjoyed serving you all, and I hope that we were able to provide you with content and opportunities to suit the needs of you and your students! One quick reminder: FeriaSCSC is coming in late spring of 2019; we have to wait on USC to confirm before we can announce dates, but look for that after the new year. You can start preparing now by heading over to www.FeriaSCSC.org and reading through the information there—including what the events are, what the prompts are, any rubrics we might use, how to form a team, and how you can best prepare our students to compete! I hope you all enjoyed your well-deserved break, and I am wishing you all a semester of warmth, friendship, merriment, and new energy . With January comes a chance to start anew with our students—and with January comes our newest President: Bethany Battig-Ramseur, the 2017 Sigma Delta Pi Spanish Teacher of the Year! She is amazing, and she will lead us in an amazing year in 2019! There is something so invigorating about attending a conference session/presentation and walking away with a fantastic idea! It inspires you! It encourages you! It motivates you! This year at FLANC 2018 my colleagues and I had the opportunity to attend and present at 6 different sessions. While we did spend most of our days presenting and sharing with others, we also had the opportunity to attend other sessions. One of the most invigorating things about attending a conference is when you can do it with teammates. While funds are often limited, it’s really important to attend with others! This gives you an opportunity to share and talk through ideas while they are still fresh in your head. Presenting with others also works to bring about comradery as you work through ideas and develop a presentation. Sometimes attending with team members forces you out of your comfort zone and can bring about great things! This year my colleague in German was presenting during a timeslot that would keep her from attending a German presentation that she was interested in. So, I volunteered to go for her. My own level of German is lower than Novice low. 😉 However, I figured I could learn something and bring it back to her. The German session I attended ended up being the one that inspired me, encouraged me and motivated me! It’s funny how sometimes when we are willing to step outside of our comfort zone just a little the rewards that we can see. To check out the sessions my colleagues and I presented click here. The Office of Standards and Learning is pleased to announce the State Board of Education’s approval for the South Carolina Seal of Biliteracy, an award that recognizes students who have attained a functional level of proficiency in two languages (English and one other language) by graduation. The South Carolina Seal of Biliteracy serves to certify attainment of biliteracy for students, employers, and universities. It is a statement of accomplishment that helps to signal evidence of a student’s readiness for career and college, and for engagement as a global citizen. The full guidelines can be accessed here. This is a great opportunity for students in the state of South Carolina! The AATSP-SC board has an opening for Webmaster and Coordinator for the National AATSP Poster Contest beginning in Jan 2019. Please complete the form located here. We would also like to welcome Ben Coates as our new Communications Manager. Ben Coates serves as Associate Professor of Spanish and Spanish Education Coordinator at North Greenville University. Before teaching at the college level, Ben taught K-12 Spanish in Spartanburg and Union Counties. He earned the PhD at la Universidad Nacional de Educación a Distancia (www.uned.es) in Spain in Hispanic literature, and his dissertation received the Award for Outstanding Dissertation from la UNED. In 2016, while serving at Gardner-Webb University, he was given the Excellence in Teaching Award. Do you have some amazing resources for Hispanic Heritage Month? Have you created an amazing lesson? Have you broken down in tears or had an A-ha moment you’d like to share? Send your articles to Sra. Derosadavis@gmail.com to be included in next month’s edition of La Vela. Produce a 2-3 minute video in the target language* addressing a professional topic. This year marks the 14th annual South Carolina Spanish Teacher of the Year contest, sponsored by The College of Charleston and The Citadel’s chapters of Sigma Delta Pi, the National Collegiate Hispanic Honor Society. This fabulous opportunity was announced last February at https://scspanishteacheroftheyear.org/2018/02/14/14thannualcontest/ and gives teachers of our state a chance to highlight their teaching successes at the next level, along with providing some other incredible benefits. We hope you might consider applying for this prestigious award this fall for several reasons. To start, preparing the nomination packet provides a unique chance for reflection, as the required materials include recommendation letters, a submitted lesson, and commentary on that lesson, 5 examples of student work with teacher feedback, a statement of teaching philosophy, and an updated curriculum vitae. More specific information on the nomination requirements can be found at https://scspanishteacheroftheyear.org/nomination-details-for-14th-annual-contest/ but the AATSPSC board would also be happy to answer individual questions on the application process so feel free to reach out to us, or to the Founding Director Dr. Mark DelMastro, who sponsors the contest and can be reached at delmastromp@cofc.edu. We have seen how going through this nomination process can help to solidify approaches to teaching, student proficiency and beyond, while really giving you a chance as the educator to dig deep into your last few years of practice to highlight the great experiences and articulate the learning curves we have all gone through during the not-so-great experiences. Making connections with fellow educators and providing advocacy experiences are other great reasons to consider applying for this prestigious award in our state. The networking possibilities are truly endless! Dr. Mark DelMastro’s statement on the award can be accessed at https://scspanishteacheroftheyear.org/about/ and is chock full of details on why Spanish language instruction is so crucial in the state of South Carolina and beyond. What better way to prove to your administrator or parent base that you deserve that grant you’ve been diligently working or that new free reading library you’re hoping to establish than to apply for this award? Additionally, your work has the chance to reach some truly great educators and aspiring educators, since this year’s board of judges has many among their number: https://scspanishteacheroftheyear.org/board/. Finally, each year, the winner and 2 runners-up are treated to some pretty swanky perks. Three finalists are given a voucher for a November 15th overnight stay in downtown Charleston (and a delicious breakfast the following morning!) at the historic Francis Marion Hotel. Those three finalists are then honored at a 7 pm ceremony the night of Thursday, November 15, where they are presented with beautifully personalized plaques at Alumni Memorial Hall at The College of Charleston. The Teacher of the Year award winner is also announced at that time and given a $500 cash prize, generously provided by Dr. D. Virgil Alfaro, III. Past TOY’s can be found on the website https://scspanishteacheroftheyear.org/past-awardees/ and photography of each year’s ceremony can be found on the Facebook page at https://www.facebook.com/SCSpanishTeacheroftheYear. This year’s deadline is coming up this month on September 15, so get those creative juices flowing and consider encouraging a colleague to apply or applying yourself in the next few weeks! Of course, we’d love to feature your win here on the AATSPSC blog and social media platforms, too. Hope to see you in Charleston in November! Have you ever been asked about your philosophy as a teacher? How have you addressed all of the components of teaching Spanish/Portuguese like proficiency, the three modes, and culture? Below you will find several examples from our members to help you develop and frame your own teaching philosophy. My teaching philosophy is driven by the five modes of communication; interpersonal, presentational writing, presentational speaking, interpretive listening and interpretive reading. Through backward design, I am able to plan instruction with the end goal in mind. The design serves as a blueprint for developing units, writing lessons, and developing formative and summative assessments that include cultural connections, opportunities for mastery and proficiency. By creating units that are relevant and applicable to real world situations, students are provided favorable activities that allow them to effectively communicate on a variety of situations in the classroom and the community. Through collaboration, students are provided multiple opportunities to interact, share, react, express feelings, and give opinions by being creative with the language, elaborating, extending and refining their communication skills. These situations are designed so that language acquisition occurs through interpersonal interaction, the negotiation of meaning and comprehensible input. By incorporating Kagan structures into my daily lessons, such as Rally Robin, Rally Coach, Round Robin, Timed-Pair-Share, teambuilding occurs. This is the process by which students get to know and respect each other as well as value their teammates. If you were to walk into my classroom, you would witness a true sense of family and community. Students know each other well and are comfortable, supportive, and respectful of their classmates. They also encourage each other to be innovative and creative with the language. This type of collaboration and teamwork transcends the classroom setting and is a life skill that teaches students how to effectively communicate and work well with others while managing their emotions. At the same time, they are able to review content and/or master newly learned material. Students then bridge the interpersonal mode with the presentational speaking and writing mode. Learners are given a variety of topics and through the appropriate media, they present information, concepts, and ideas, to inform, explain, persuade, and narrate while simultaneously adapting to various audiences of listeners, readers, or viewers. Students should be capable of adapting and adjusting to situations they are not familiar with, with proficiency and the ability to convey their message. Through information media and technology, I am able to access and incorporate authentic resources that target the interpretive listening and writing modes. These materials and documents allow me to provide students listening opportunities that are rich with culture. As a result, students can interpret, analyze and understand what is being heard, read, or viewed, on an array of topics. In addition, students are able to compare and contrast the embedded cultural elements with their own experiences. By identifying similarities and differences in the target culture, they gain knowledge, a more global perspective and an appreciation for opinions and cultural traditions that are different from their perspectives and experiences. The message this creates and that I convey is that the world would be a very dull place if we were all the same and it is the incredible diversity amongst people throughout the world that makes it such a fascinating place. As a Spanish instructor, my teaching philosophy includes two basic tenets – putting students’ best interests first and infusing their learning experience with as much proficiency-driven, cultural exposure as possible. This two-pronged approach allows me to provide my students with an environment that not only satisfies current standards for world language proficiency around the globe, but also emboldens them as learners to use their Spanish in the real world, ultimately reaching higher and higher levels of language acquisition. Nothing fulfills me more as a teacher than inspiring my students to uncover their own interests and pursue their own passions through their increased use and understanding of the Spanish language and associated cultures. Important in heightening students’ cultural exposure to Spanish language learning is establishing a positive environment aimed specifically at enabling students to chart their own goals and progress in their individual journeys towards proficiency. The value of establishing good relationships to better understand the variety of student motivations and to incorporate those different learning styles into lessons cannot be underestimated. Also, consistent exposure to the target language is a goal I encourage students to pursue both in and out of the classroom. An immersive, collaborative environment – including students selecting their own Spanish classroom name for the school year and initiating conversations with native speakers in their communities through a variety of projects – is imperative in this process. Additionally important to proficiency-based language learning is providing students access to an environment in which they feel comfortable to take risks, whether those are linguistic risks in trying out a new phrase or verb construction, or cultural risks in attempting to understand products and practices different from their own, enables growth at higher levels than a textbook-based approach alone could ever do. For this reason, I believe it is vital to incorporate new authentic resources in technology, music, movies, podcasts, Twitter trends, etc., into my teaching. Not only does this practice keep me invigorated and challenged alongside my students as a fellow Spanish learner, but it allows me to model the risk-taking behavior that I encourage my students to pursue as they choose their own projects, research, and presentations based in Spanish-speaking cultures and countries around the world. Whether using Google Expeditions to virtually explore Machu Picchu together, creating my own curriculum for a new T.V. show from Spain on Netflix, or tasking my students with creating video introductions of themselves to interact with Primero Arte students in Guadalajara, I am not afraid to try something new, and I want my students to feel the same way. Imperfection is not punished in my classroom; rather progress is celebrated often and sometimes ridiculously, with a spontaneous bachata lesson or unusual food tasting – part of my philosophy of teaching is that language learning should be fun or can at least be funny! I am committed to connecting with students at all costs, and am not above assigning a silly gif or meme project to do so. Ensuring that students understand the rubrics being used to assess the 3 main skills I am interested in fostering (interpretive, interpersonal, and presentational communication) is another important piece of my philosophy of language teaching, and we do this often in my classroom, through individual, group, and whole class activities. Incorporating good self-reflection practices after assessments and projects allows students to honestly and accurately diagnose their strengths and weaknesses, and hone them appropriately. Although the proficiency method is not always easy given the traditional classroom setting in which we often work as educators, it is ultimately much more rewarding for both students and teachers. For me to see each individual student gain confidence and grow in their own unique linguistic skill sets means much more than it ever could to hear a classroom full of monotone voices reciting grammatical rules and regulations without passion or purpose. For this reason, my teaching philosophy includes the firm belief that world language proficiency standards provide a mutual challenge to everyone involved in the education process. As a proficiency teacher, it becomes necessary to constantly collaborate, innovate, and expand cultural knowledge in order to better communicate with students, who by necessity are constantly interacting with others in a vibrant, ever-more interconnected world. Students must feel prepared to respond appropriately to the increasingly competitive environment of the global marketplace. What better way to equip them for the challenges of the future than to provide an invaluable, opportunity-increasing skill such as the acquisition of Spanish? The school year is coming to a close and many schools are still looking for qualified Spanish/World Language teachers. Openings can be posted at Cerra or check for other job opportunities here. If your school district is looking for a Spanish/Portuguese teacher, feel free to send your openings to Trixi at sra.derosadavis@gmail.com for posting here. Feel free to share these openings with others. I won’t lie: like my drinks, my classroom is sometimes on the rocks. Other times it’s neat, and often, straight up. Luckily for my and my students’ sanity, I am at my core a positive person and an optimist. It’s been my innate tendency since childhood and also how I’ve continued to train my brain to operate as an adult. So, when I can’t shake a teaching funk (looking at you, fall semester 2017! ), it’s both unexpected and uncomfortable. Especially now, in July, there is a lot to think about and I have to really reflect on how I feel, why I feel that way, and what to do next to make the 2018-19 SY an even better one. When I began using proficiency as a classroom staple for engagement, reflection, assessment, feedback, environment, and more, I noticed something. As optimistic a person as I already was, proficiency-based teaching has made me even more so. Because it focuses on the additive and not the subtractive, what they can DO and not just what they “know” (too vague! ), what they HAVE ACQUIRED (yes, I yelled that) and not what they’re lacking, suddenly a light shines on the wins, and not the losses. Confession: I have some amazing former students. It’s so great to see them grow and build their lives post-Spanish class and beyond, and I’m thankful for social media that I can do so easily. But, part of the charm is that I don’t have to see them every day. Once they leave our classroom, slowly the everyday irritations or awkward situations fade away, and all we see in our heads is their highlight reel. I find that it makes me more thankful for my beloved students and endears me to more challenging ones, and those are both wins. But, we must keep in mind how we’re telling them how they’re doing – period. Formative or summative, written or verbal, re: a performance or their overall proficiency, how are we keeping students abreast of their progress? We live in a system that requires grades, but what else? If we truly want students to acquire language, it must be about proficiency, not points; what they can do with the task, not the number of adverbs they used; how well they did ___, not how many times they used _____. In a clothing/shopping unit, for example, this may mean your summative writing and speaking prompts ask, “How do you express yourself externally? Why?” Struggling students can talk about what they usually wear, and many who have solicited extra vocabulary from you, like mine do, like to add their opinions on piercings, tattoos, other clothing items, etc. Proficiency naturally differentiates itself. This is more useful and engaging than a summative prompt that says, “Describe what you’re wearing today and the clothing of four people around you.” Positively-framed questions like this also lend themselves to us learning more about our students in the meantime, making it an authentic task in more than one way. Another positive spin that proficiency has added to my teaching is the relief I’ve felt in keeping my instruction level-appropriate. Should they actually be able to do ___ and ___ by now? That requires some serious reading up on and studying SLA and the very principles that should be guiding how we do what we do. Planning and assessing Unit 4 based on “ser vs. estar” and “stem-change verbs” isn’t nearly as effective or sensical within SLA as using ser, estar, and stem-change verbs to complete X task, and then assessing students’ completion of said task. On a micro level, that’s tweaking our planning. On a macro level, it’s zooming out and remembering how our own children acquire language and whether or not the input we’re giving and the output we’re soliciting is level-appropriate (example: kids at age 5 still often say, “She hitted me!”, “I eated my peas!”, “Her keeps talking!” and they’ve had years of language input. So, why are we expecting most/all to master preterite/imperfect, ser/estar, ir+a, tener+que, object pronouns and beyond after 1-2 years? Limiting their prompts and tasks based on grammar points is what Krashen calls the Constraint on Interest. Recasting, redirecting, and replying – in a proficiency-based classroom, these all can get a nice facelift. Recasting, research shows is mostly for the teacher unless done very intentionally and that intention is made clear to students (a tricky task). Rarely do students get anything out of it in terms of, “Oh, I said me llamo es? I meant to say me llamo, how could I have forgotten?! Gracias, profe!” That’s how it happens in our heads, of course, with a climactic hug and dramatic theme music, but, truth be told, their ears gloss over it usually, and that’s natural. Proficiency has forced me to stop recasting where normally I would, or heaven forbid correct the students while s/he is still speaking (frustrating and embarrassing for them, that we tend to not realize). As a result, I’m a better listener, and I’m listening for what they are including, not what they’re missing. Because proficiency differentiates itself, it’s also becomes easier to redirect students on certain tasks. If they’re stalling out on one part and just sitting there, staring at their paper, proficiency makes it easier to think on your feet and help them get started. Today, a new student was doing just that: staring at his paper, pencil in hand, not doing anything. I was pretty sure he just didn’t know where to start and was probably overwhelmed with the reading assignment. Because I want to see how he’s doing and not just what he’s doing, I told him to just pick three of the ten New Year’s resolution tweets to read and comment on, and then move on to creating his own. He got to work, and then it was interesting to see which he chose – win, win. Before basing my classroom on proficiency, I think my focus would have been on him finishing the ten only because that was how many I assigned and, “Gosh darnit, Johnny, what other option is there? Just do the work!” But there are options, and there should be, and they make it easier to accommodate remediation, “review”, struggling students, IEPs, 504s, and more. Replying is important, in verbal and written form. With less recasting, I can focus on really hearing my students. When I’m writing feedback, it’s usually how they can level up. “Vary your verbs for novice high!” “Keep injecting your personality and experiment for intermediate low!” Telling this to students, plus then making sure they know how to do it, can make all the difference. 83% doesn’t mean anything – a proficiency level does. “I got a 90% on the test!” isn’t as empowering as, “I wrote 2 pages and Señora Blanco said it was my best yet!” sounds cheesy but is attainable. Ultimately, proficiency highlights possibilities as opposed to deficiencies; when we put it like that, what’s not to be optimistic about? Congratulations to all of the participants and winners of FeriaSCSC! The first annual FeriaSCSC was held on April 28th, 2018 at USC Upstate in Columbia, SC. Check out the photos from the event. For a long time, Snapchat lived in a compartment in my brain with other things I no longer need (high school boyfriends, size two pants, The Backstreet Boys, etc.). However, in the fall of 2015, knowing we already had a class Instagram page and that I was open to trying new things, my students begged, “PLEASE start a class Snapchat! PLEASE!” I was hesitant, of course, but they were very convincing, and, as a bonus, my chosen user name was available. “OK, let’s do it, but no funny business,” I said, and we embarked. Three years later, and boy, were they right. It has been such a fun journey to experiment posts, use different functions, and overall interact with them via Snapchat in ways that may not be possible otherwise. I now use Snapchat in our in-class warm-up (anticipatory set) activities each day, as well as to post notifications (in addition to remind.com), go on scavenger hunts, and more. Let’s jump right in, shall we? When Laura Sexton blew my mind with PUEDOs (“I Can”s) last fall, I immediately thought of Snapchat. (Also, I immediately made a how-to video, but forgot to turn on audio, so now it serves more as an ode to silent movies, whoops!) I started giving warm-up options, and told students to choose X amount of the options given. Option Six every day became, “Check and respond to anything on Snapchat,” and that means that I needed to have posted something onto our class Snapchat “story” that is high frequency and/or applies to our current unit in context. Snapchat comes with built-in (different every day) videos via the back camera (open a picture; hold your finger anywhere; outward camera video filters will appear; choose one) – these are really neat for you to create quick, improvised input videos with high-frequency vocabulary for your students. These videos are made with your custom Bitmoji and are really fun to use, especially if your Bitmoji looks a lot like you. Suddenly, you have an animated video of yourself doing something out of the ordinary, humorous, or both. They’re engaging and then you can pose a question or story as the caption — in the example screencast here, I ask, “Does Mrs. White have allergies?” and students can respond, “Yes, she has allergies.” Sometimes, especially early in the semester, when I pose a third-person question, I have students respond in the first-person form, “Yes, I have allergies,” which shows me they need more input in the third-person forms, i.e. more opportunities to dialogue about other people as well as about themselves. My students respond directly in Snapchat, and it affords me a quick, easy formative assessment opportunity. I love it! There are limitless opportunities for using Snapchat as described above: pictures in class with captions (love capturing moments! ), scavenger hunts where they Snap back once they find ___, QR codes to authentic resource videos and more. Another great way to use the story/feed function is to post authentic resources that students probably won’t have seen otherwise. I know that I very intentionally have my phone in Spanish and follow certain pages/people for input opportunities – now, we can share them with students without having to print an article, create an activity, or suggest they follow X and Y but never know if they actually did. We can offer up more opportunities to expose students to language and encourage choice. Perhaps for the aforementioned Option Six in my warm-up activities, in addition to or instead of just one or two options that they have to comment back on, I say, “Pick one and ____,” and I’ve posted multiple. A screenshot from a news source or celebrity feed works for the picture, and then a link to the article can be posted using the attachment feature. In front of your very eyes, you have data on what students are viewing, if they’ve taken screenshots of favorites, and students can respond directly. So, we know authentic resources are awesome, but what about the resources we curate ourselves for our students and our own language classrooms? An example: my Spanish II students are always beginning a travel unit right at the beginning of spring teacher conference season in March. That means we’re talking travel preferences, packing habits, adventures, transportation and more when I’m headed to SCOLT, CSCTFL, NECTFL, and FLAG. Bam! With the class Snapchat I can then post instant pictures and videos from my trips in real time (and then save the stories by the way, for a video montage to be posted on a class YouTube, EdPuzzle, etc.). I can also customize the input for my specific students and unit objectives, which is super cool. If I have specific pictures that I think are particularly eye-catching, artistic, or special, I will also use our class Instagram. From Instagram, I can screenshot that picture and then put it into Snapchat and double-dip on the likelihood that students will see and read it. To take it a step further, I have downloaded and synced up the Chatbooks app on my phone with said class Instagram. I am a little bit obsessed with Chatbooks because for every 60 pictures I post to our class Instagram, they create a tangible photo book that then mails to me for $8, auto-shipped and auto-billed. My classroom now has 11-12 volumes that span the five years I’ve had the account open for classroom use. The Chatbooks can be used for displays, extension activities, extra credit, FVR, picture of the day (via document camera), free response, the list goes on! 2) If a student sends an innocuous but irrelevant message for “streaks”, I block them (until they notice, ask, and promise to not clog up my phone again). What have I missed? Find me at @PRHSspanish on Instagram, Twitter, Snapchat, or at ACTFL (#ACTFL18) in the Social Media Lounge where I’ll be sharing samples, examples, visuals, and quick how-tos on all of the above! AATSPSC Poster Contest Winners Announced! Have you registered for FeriaSCSC? Don’t forget to register NOW! REQUESTED SCHEDULE: 2x/week for 1 hour per lesson — Tues/Thurs, 5:30-6:30 p.m. Candidates must have a bachelor’s degree or equivalent and at least 2 years of experience teaching or tutoring Spanish. Global LT’s tutors are independent contractors who create their own lesson plans and select any books to be used. Anyone who is interested should please send a resume and hourly rate to MTablac@Global-LT.com. You are also welcome to forward this email to other individuals or groups. The Southern Conference on Language Teaching (SCOLT) held their annual conference in Atlanta, GA, March 15-17, 2018 and I flew all the way back from Nebraska to be there! It was an amazing experience this year. 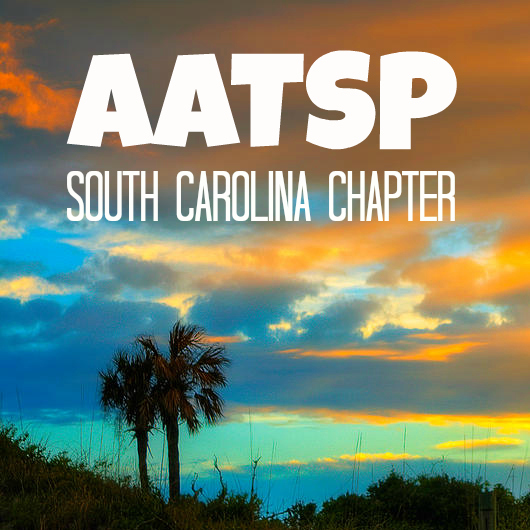 As the former webmaster of North Carolina’s chapter of AATSP and the current secretary/webmaster/social media coordinator of Nebraska’s chapter of AATSP, it was super fun to connect with all my AATSP people on the east coast. It’s always fun to connect with my AATSP peers at conferences all over the country, but SCOLT is tops! Sheri Spaine Long, the new executive director of AATSP, poses by the AATSP contact table with Stacey Margarita Johnson, faculty at Vanderbilt University and producer of the We Teach Languages podcast, and L.J. Randolph, faculty at UNC-Wilmington and President of AATSP-NC. Three of my favorite sessions were 1) Put Good In; 2) Scrambled Eggs; and 3) Social Justice in the Language Classroom. Put Good In was a presentation by Carmen Scoggins from Boone, NC about taking care of yourself as a teacher, putting good in to get good out. She provided a ton of resources on her website for the presentation: http://scogginsc.wixsite.com/putgoodin. Scrambled Eggs was a workshop on assessment and how we can make the ways we are already testing our students more valid and reliable. The presenter, Judson MacDonald, also provided lots of helpful resources on his website: http://judsonmacdonald.com, just click on Resources and then Scrambled Eggs. Finally, Social Justice in the Language Classroom was a wonderful presentation by AATSP NC’s president, LJ Randolph, and his colleague Stacey Margarita Johnson from Vanderbilt University about considering social justice in our language classrooms. These three sessions were great representations of our beloved Carolinas but you can find even more awesome resources by checking out the #SCOLT18 hashtag on Twitter! SCOLT is a wonderful place to find new ideas and connect with colleagues all over the southeastern US, and even a few transplants like me too! You go home from SCOLT with a bag of swag, a notebook full of ideas for your classroom, and memories with friends that you’ll treasure forever. If you’ve never been or if it’s been a while, I’d highly recommend checking it out next year when it comes to Myrtle Beach, SC, March 21-23, 2019! Come hang out with Erin, Stephanie, and me at the beach! It’s sure to be a blast! In the meantime, feel free to reach out and connect with me on social media. I’m an avid Facebook (https://www.facebook.com/amanda.romjue) and Twitter (https://twitter.com/AmandaRomjueEDU) user. I’m always looking for new ways to help support other teachers. In collaboration with the aforementioned Judson MacDonald, we created The Intercultural Classroom (http://interculturalclassroom.com) a completely free and open resource for Spanish teachers of all levels to incorporate more authentic materials in their classrooms. Please check it out and let us know what you think. I’m also developing a new blog to share and connect with other educators at all levels. WeveGotThisTogether.com is set to launch on April 9, 2018. I hope you’ll join me there to connect with other teachers and remember we are all in this together. Are you planning to have your students participate in Feria? Read our tips and tricks on how to prepare your students this month! Check out the tips for this month on how to prepare your students for Feria. Deadline Extended for our Poster Contest. Free sub lesson plans included! This link includes a FREE lesson plan on how to get started! Not to worry! Sixteen students is the maximum you are allowed to bring; you are welcome and encouraged to bring smaller teams if that’s what works best for you. You could also consider bringing a small group of students from different schools within a single school district to compete as a district team. Head over to our FeriaSCSC website to get some tips and tricks (https://feriascsc.org/tips-tricks/) to prepare! This is a brand-new competition, so everyone will be new to it and no one will have an advantage. Remember that all possible prompts and the rubrics for writing and speaking competitions are available on that website, as well as the list of spelling words. Teaching in the Native Language, how hard can it be? Teaching Spanish or any other world language is one of the hardest subjects to teach. Whether you are teaching elementary, middle or high school, you are not only teaching language but so much more. We already know that being a teacher is not only teaching but being a mom, a tutor, a counselor among many others. (Not literally, but we do wear many hats while in a B&M classroom school setting) Now, imagine having the responsibility of all those roles plus teaching Social Studies, Math and Art while also teaching them in the Target Language (TL). The huge struggle comes when some of us, as native language speakers, have to teach language basics and also stay in TL language while teaching. This, of course, is easier said than done. Teaching the language basics like grammar and vocabulary in the native language is harder than teaching a language that you have already learned. When you learn a language, you are not only adhering the language but techniques to utilize in the daily life. Let’s think for a moment, if your native language is English, could you teach all the grammar skills without reteaching them to yourself? It is hard! All because this only comes to you in naturally as an instinct. The first step to teaching this was to reteach myself. As teachers, we need to have as much knowledge of what we are teaching as we can. This, of course, is to feel secure and project that security to our students. Then, create great lessons with enhancing activities. Teaching Spanish vocabulary can be substantial. There are 21 countries that speak Spanish. Each of those has their own history which proceeds to having their own dialects. There is no perfect Spanish because it is all cultured influenced. I will not only teach the TL in my Puerto Rican version but in the other 20 versions. Even though I am Puerto Rican, I can understand people from other Hispanic countries. I wanted my students to be the same way, I wanted them to embrace and love the language as a whole. I made it my duty to teach students the wide vocabulary. For example, the word car can be said as “auto”, “coche”, “automóvil” or “carro”. Every time I did a vocabulary lesson we would do enhancing activities so they remember them. One of my favorite games for this is “cucharas”. The amazing result of teaching students is that they choose the word that most represents them. At the end, they stick to the word they preferred and this created their identity in the TL. Staying in the language when teaching is the hardest. That look the students give me when they don’t understand or can’t keep up breaks my heart. I can relate to them because when I came to this country I was twelve years old. Although I knew the English language my ear was not accustomed to it. The only way I got to survive and learn the language was by surviving in a classroom where the teacher would only speak English. Some of us native Spanish speakers grow up in a battle of understanding. So, it is hard for us to teach and not be understood. We learn English to survive and be understood. When it comes to teaching Spanish, we fight that battle in reverse mode; that is why staying in the language is so hard. There were a lot of techniques I put to work when teaching in the B&M. For instance, when I taught elementary I had a magic hat and Señora Martínez magically spoke Spanish. The students knew that when the hat was on English was not allowed. I also always had a mailbox (Every grade I taught) if the students were shy to ask a question in the language or didn’t understand they would let me know in a little note. There are many other ideas that teachers can use to make sure they stay in the TL because it is what our students need. Although my BA is in teaching English as a second language, I can use my language to reach out to the world. Being a Spanish native speaker gives me the opportunity to teach my language and culture. No one said it would be easy but I know it will completely be worth it. Check out this fantastic opportunity for Professional Development at USC Upstate. The World Languages Program at the University of South Carolina Upstate looks forward to seeing you on Monday, February 19, for the 2018 Twentieth Anniversary Celebratory Reflections Workshop titled – Ready? Set, Goal! Strategies for Developing Proficiency in the Classroom. In November I had the privilege of attending ACTFL’s 2017 National Conference in Nashville with some colleagues. I hadn’t attended the conference since moving to South Carolina in 2009. Actually, over the past couple of years, I hadn’t attended many world language specific conferences at all. I instead had gotten comfortable following my world language teaching community on twitter and welcoming secondhand quotes, PPTs, and take-aways. You know how it is…. life happens and before you know it you’ve missed your local, state, regional, and national conferences multiple years in a row. Hey, don’t judge…I’m not proud of it but it is an easy trap to fall into if, like me, you allow excessive busyness or complacency to creep in! So, I was off to Nashville! There’s no replacement for community! Engaging in the World Language teaching community at large refreshes us and reminds us that we are part of a larger team and purpose. When we come together with others who share our same set of core beliefs about the importance of language learning, it fans our flame. Those who engage in this the most authentically and frequently have a flame that is contagious. We’re awesome! The things we (and by we I mean YOU ALL out there teaching) are doing in the classroom and online, in our communities, and in the places we travel are innovative and dynamic. It was so cool to see and hear about a wide variety of strategies, tools, technology, and topics being implemented and pioneered by World Language teachers in our country and here in South Carolina especially. We are not just teaching verbs and vocabulary anymore. We are teaching empathy and tolerance and resilience through the platforms of our language classrooms. We need each other! It is so easy to get “stuck” inside the 4 walls of your own classroom or even worse…. stuck in a cycle of negativity you may be experiencing within your team, school or district. You quickly forget all that you have to offer our WL community and how much others outside of your immediate teaching community have to offer you! So here’s a challenge: submit a proposal to present at a local, regional, or national conference in 2018, either individually or with a team of teachers! You are doing great things that others can learn from. Reflections is key! Attending the conference left me with a notebook full of all sorts of new ideas and a renewed passion for teaching language. But what if I leave it at that? Nothing would change and the experience of attending the conference would be partly wasted. The key to improving as a teacher is to reflect on what I’ve learned and to plan some next steps of action. What new strategy will I implement? What new technology will I take a risk and try? What will I stop doing because I learned a more effective way? If we don’t take the time to reflect, we will miss out on applying our learning and improving as educators which ultimately helps our students. I realize these points are “preaching to the choir” so to speak. I’m sure you are actively growing and going as much as you can in your current stage of career and life. But if you are like me and tend to get caught up in the busyness that life sometimes brings, I hope this is a timely reminder to get back out there and engage with your community of World Language educators. You’ll be glad you did! Happy New Year! Did you attend ACTFL 2017 in Nashville? Share your thoughts with us! Complete the form to share with us your ACTFL experience and reflections. Have you checked out our new Feria site? Check out the new site and learn more about opportunities for your students! Weren’t able to attend AATSP of the Carolinas Fall Conference? Check out some of the presentations on our conference page! “Nous sommes voitures”- We are cars. Yep, that’s what I wrote on my French 3 final exam. That is when Madame Camp suggested that maybe French was not my language. She turned out to be correct, and I went on to study Spanish and become a Spanish teacher. Many times in my career, I have thought back to that moment and wondered what if I had figured out way BEFORE French 3 that French just was not my language. You have probably had students yourselves that have come to this same realization. In order to help students make this decision early on, my colleagues and I at VirtualSC have spent the last year creating a course designed to help students make a determination about which language truly appeals to them. The course, Exploring World Languages in South Carolina, addresses 4 core languages in the three modes of communication, in order to give students not only a glimpse into the culture and basics of a language, but also to allow them the opportunity to delve into language learning. Exploring World Languages in SC specifically looks at how students can use language within South Carolina. It is designed for 6th-8th grade students who are interested in learning more about World Languages but who do not know which language they might like to study. The course is offered online and free to all students in the state of SC through VirtualSC. Often as educators, we are asked “Why should a student learn one language over another? ”. Exploring World Languages in South Carolina does not promote one language over another, but instead give students sample context of scenarios in which they might find themselves using or needing a language. The course begins with an introduction to language learning, including discussion of how important learning another language is, how we learn languages and why learning a language is important here in SC. The second unit introduces students to Spanish, where students complete an Integrated Performance Assessment (IPA) based unit on likes and dislikes of food. Students are given opportunities to speak and complete an interpersonal task through live online sessions. Students are also able to complete optional extension activities, like doing the Mexican candy challenge and sharing whether -Me gusta (Like) or No me gusta (don’t like). The third unit of the course introduces students to German through the numerous German businesses in SC. Students learn how to introduce and describe themselves to potential business people in German. They complete interactive conversation simulations as well as a live session to practice interpersonal communication. The fourth unit of the course brings to life the Latin language for students. Many of our English words derive from Latin, giving our students a beginning look into word origins. In this unit, students learn to talk about their family: pater, mater, frater, soror, and their home. Students share a selfie with a family member in the extension activity, sharing who the person is in Latin. In the fifth unit, students are introduced to the French Quarter of Charleston. Students learn how to talk about places and their locations. Did you know that the French Quarter of Charleston houses some of our oldest and most prolific landmarks? Students are able to virtually tour Charleston learning about the history and the French language. In the final unit of the course, students are given the opportunity to complete a lesson on either American Sign Language or Gullah. Students who choose the American Sign Language lesson learn more about the SC School for Deaf and Blind and how they can use sign language with members of the deaf community. In the Gullah lesson, students are able to learn more about the history, food and song of the people who live along the SC/GA coast. Extension activities for Gullah include making Beaufort Stew or a Sweetgrass basket. The students’ language is brought to a conclusion in a final lesson, where they review what they have learned in the course and use their interpretive skills to help determine what type of businesses potential business owners might be interested in starting in SC. This summer, we were able to pilot the course with a small number of students. The feedback we received from these students made it clear that our efforts to put together a worthwhile and fun course for students were successful. Many of the students continued to make connections with the languages outside of the course, sharing what they learned with teachers and peers. I would encourage you to consider sharing this course with students who might be interested in learning languages, but are unsure how to get started. If your school district does not offer middle school languages, this is a great way to get students looking at languages and language learning. Our keynote speaker will be Prof. Devon Hanahan of College of Charleston. We will also be introducing our brand new competition for students! We are very excited about the upcoming conference and hope to see you there! Please look for registration information soon. The conference begins at 8:30am with breakfast provided. Keynote starts at 9am. Cost is $30. Full-time students pay $10. Pre-service and beginning teachers are encouraged to attend! Lunch is on your own and the conference will end at 3pm. Need help convincing your administration to fund your attendance at the conference? Check out our Administrator Letter. We are language teachers. We are those people many just don’t understand how we can actually speak the language we studied all those years. Then, we take it further and we teach it. Since becoming a Spanish teacher, the one thing that continues to amaze me is the number of people I meet that can’t speak another language. While nearly all of them studied and “learned” Spanish or French or German, very few of them can actually do anything with it. When I take a moment and reflect, can I blame them? I would imagine, many of us “learned” the same way. We received vocabulary lists for the unit. We practiced, then we took a vocabulary quiz or test. We learned some grammar concept, how to conjugate in this tense or use that prepositional phrase. Of course, there was a quiz or test for that too. We did some fill in the blank practice (“plug and chug”), and finally to round it all up we wrote a few sentences using both the vocabulary and the grammar from the unit. Sometimes this was on the test with the plug and chug and matching vocabulary. I’m not here to judge it, I went through it too. So, what made me different? How in the world did I go from that classroom to where I can speak, and read, and listen, and converse in Spanish? How in “the world” is exactly how! I put myself on a plane (twice) and went and lived the language. I met people, I shopped in stores, I ate in restaurants, and I had to think outside of units and tests and fill in the blanks. Here is when and where the change is realized. When I first started teaching I went right into what I knew about teaching Spanish, what I had experienced in the classroom. There’s a textbook, and standards, and district curricula, vocabulary, and common assessments. This is the way it had always been done, and I was expected to do the same. The first few years, I pushed to try new things and sometimes had the opportunity. However, when I moved to my new district (and when I returned again) I was truly able to work with like-minded people and it has been amazing. The district where I currently have the opportunity to work still has units, vocabulary chunks, and even common assessments. The perspective is just completely different. The units and auxiliary materials are common across languages; thus, it is all produced in English for teachers. The vocabulary isn’t a set of nouns, set of verbs, set of adjectives and such. Instead, these units have chunks and main ideas and concepts. The teachers are expected to teach in the target language, and like children learn language from birth, just expose them to all of the language that language has to offer. There is a time and place for grammar and vocabulary practice, but in the end what the students can DO with the language is where we focus. The entire district scores on a proficiency rubric. Students don’t have homework grades, participation grades, or even extra credit opportunities. We only score what they do, create, or how they use the language. Students use some vocabulary we provide, even some they find on their own, and combine it with structures and things they hear to create with the language. The days of students pulling up a grade to passing because they were well behaved, or turned in all their homework, or bought some new markers for the classroom are gone. However, also are the days of “passing” Spanish class. There are specific levels expected from one level to the next to promote; and of course in a day and age of GPA’s and college applications those scores to have to transfer to some numeric value on a one hundred point scale. However, when a student receives a score of a “seven”, or “Novice High”, it means something. It represents exactly what they can do with language. It shows that they can manipulate what they know and write or speak at a certain level and interact in a certain way with another speaker, and even at what level they can interpret meaning from reading or listening in Spanish. It isn’t an average, resulting in one high or one low grade pulling that reflection of ability to create in one direction or another. It is a reflection of what can a student do, consistently, throughout the year, with a variety of topics. The transition for a teacher to this type of scoring has been interesting too. I started teaching those noun lists, and verb lists, and conjugation charts. I started with the worksheets and “plug and chug” style quizzes and tests in my early years. In my defense, that was the expectation. However, that approach to instructing did not fit with this type of scoring. In order to provide students with chunks, I had to start using them. I had to really commit to the idea of “immersing” the students. My classroom had to be that international experience I had, without leaving our little town in South Carolina. I am now just on the other side. Instead of being the foreign student trying to figure out what is happening all around me, and the person in front of me is rewording, pointing, acting out, and becoming completely animated trying to explain, I’m that animated person. I’m pointing, drawing, dancing, and rewording. In addition to completely engulfing them in the language, I had to change my mindset from “there is one correct answer” to “show me how YOU would use this” or “how would you explain this”. I have had to sit back and let my students begin to solve their problems. Instead of quizzes and tests, they have real world problems or scenarios. My students have to draw a card that says they broke their leg (no specific scenario provided), walk into our hospital scenario, and figure out how to converse with a nurse to explain what happened. My students have to plan a trip to Pamplona in July, figuring out transportation, a hotel/hostel/air bnb, restaurants for meals or grocery stores to purchase food while working on a budget and provided only authentic materials in Spanish. They have to take the base vocabulary I have provided them, build on it, and problem solve to “survive”. As adults, we all know there is usually more than one solution to a problem. Given our own backgrounds, experiences, and expertise, we solve a problem as best fit for us. Our twenty-first century learners need to learn to do the same. This proficiency based scoring has truly allowed me to open up to that idea. The rubrics we use are from ACTFL. They don’t require a specific set of vocabulary, or a specific grammar concept to be able to move up or down in the continuum. There is some reference to past tense, or the use of multiple tenses, but it is not specific, as these rubrics are applied across multiple modern languages. There is no more a “you must be able to conjugate regular verbs in the preterite tense” to pass Spanish II. Instead, we expect students to be able to manage a few different real world settings, with a variety of vocabulary, and a functional base with grammar. We don’t want the students sounding as if they make no sense at all, but errors are acceptable. I modified some famous words from a not so educational movie, “but did you understand?”. The transition hasn’t been easy to put in place, but it has been easy to grab a hold of and try to run. My personal experience with language learning tells me this is what my students need. They need to be immersed; they need to be challenged to do, create, and interact with language in order to remember it. I want my students to come back one day and have a conversation with me in Spanish. I don’t ever want them to just tell me how much they loved or hated my class. I want to ask them how they are, how is life, where they live, and what they are doing, all in Spanish. Then, I want them to be able to put together some sort of response in Spanish, and I want all of that to happen twenty, thirty, forty years after they leave my room. While I am young, and I have a while to see if this really makes a difference, I am a believer in the change it could make for my students and those interactions in the years to come. What I learned while teaching in Tanzania. Last year, one of my professors asked me what I thought about doing some work in Tanzania over the summer. Me!? Go to Africa? I mean, I have experience with second language acquisition, leading teacher workshops, and have spent time living internationally, so I mean, I do have some knowledge under my belt. Turns out, that is precisely what was needed. Students in Tanzania speak Swahili and one of over 200 local languages, so they are bilingual to start. Some students may be exposed to English in elementary school, but many are not. Then high school hits and according to Tanzanian law, English is the language of all instruction. This is, as you can imagine, problematic. The high school teachers, in all subjects, find themselves struggling to teach the content and also teach enough English to make the content comprehensible. That is where Mwangaza steps in. Mwangaza is a grassroots organization that focuses on health and education programs in Tanzania. Every summer, they host a week-long teacher training workshop to help high school teachers learn new ways to reach their students while simultaneously supporting students’ English development. It is a tall order. Yet attendees of Mwangaza go back to their schools armed with many new ideas, strategies, and tools to help their students learn in the target language. What I learned from this experience is that teaching challenges are truly universal. Student behavior and engagement. How to differentiate with faster or slower-paced students. How to reach the students who have given up. How to inspire students and encourage their progress. All of these topics came up time and again as though they were unique to Tanzanian schools. I assured the teachers that no, these are things we all face. All teachers get tired and all teachers need opportunities to recharge. The week we spent together at Mwangaza was a chance to recharge so that the teachers were ready to go back to their students energized and encouraged. It was fun to see how all I have learned over the years about second language acquisition was put to the test with convincing these teachers that it was, indeed, possible to make their content comprehensible. It was also fun to discuss how teachers are kindred spirits, no matter where you go. It is a tough job. But stepping out of the classroom to connect with other teachers and get fresh ideas is always welcome. This November, AATSP will host its annual conference in Rock Hill. It is my hope that, like Mwangaza, our South Carolina Spanish and Portuguese teachers will leave with new tools and ideas to reach their own students. Perhaps our situations are not as dire as those faced by many teachers in African schools. But we do have our own challenges, to be sure, and we also deserve to head back to our classrooms energized and encouraged. This year we will again partner with the North Carolina chapter of AATSP for out Fall Conference. Submit your proposals here. We look forward to seeing you all once again! More information on even registration to come. Save the date! By far one of the most popular things we do in Spanish class, at all levels, is Música Miércoles (M.M.). I got this idea from Allison Wienhold of Mis Clases Locas. She blogged in 2014 about using music videos to start class on Wednesdays. I was intrigued from the start: a way to incorporate authentic material in the target language, expose students to diverse cultures, AND an alliterative name? Sign me up! Plus, music was an invaluable resource for me as a language learner. My family moved to Central America in 2005 when my parents accepted teaching positions at a bilingual school in San Salvador, El Salvador. That same year, Reik released their first album. For the uninitiated, Reik is a Mexican pop group reminiscent of The Backstreet Boys. I listened to that self-titled album on repeat until I could sing along. Mimicking the sounds (even though I didn’t completely understand what I was singing) helped me develop intonation and pronunciation skills, and reading along with lyrics in the liner notes helped my listening comprehension. As a teacher, I was eager to replicate these experiences for my students. Allison Wienhold is the queen of bell-ringers and M.M. started out as her go-to class starter for Wednesdays. Her approach is more structured now and she has a ton of resources available on TpT for purchase if, after reading my glowing endorsement, you’re ready to try it out. I ask students if they’re “ready” (listos) a lot in class. When they hear this cue at the beginning of class on Wednesdays, they know they should find a clean sheet of paper and a pen or pencil. I have not in the past collected their notes from M.M. Some like to document the song/artist more diligently than others. You could certainly have them record their work in a journal that you grade for participation or as a classwork assignment. Escriban las palabras en español que escuchan. At this point I show the music video associated with the song and students write down any words or phrases they hear in Spanish. Sometimes you have to be pretty creative and/or patient in order to find a song you think students might like that also has a video appropriate for school. I have shown live versions, lyric videos, or only a segment of a video in order to meet school environment standards. Students definitely prefer to watch choreographed music videos over any of those options, but sometimes there’s no way around it. Where to find songs: iTunes; http://www.billboard.com/charts/latin-songs; or Google search for country and genre/artists or country and top 40 ex) Chile top 40; Bolivia pop artistas. After the video, I ask “¿Te gusta o no te gusta?” and students give me a nonverbal response in the form of a thumbs up. The thumbs get pretty technical: I’ll get half way thumbs up/half way thumbs down and a student will explain, “Well, I like the video and the artist’s voice, but the lyrics were silly.” I always ask for at least two volunteers to explain their thumb vote, usually one that liked the song and one that didn’t. Your expectations for how they explain their opinions can vary by learner level, but some M.M. pet peeves of mine are any misuse of gustar, “No me gusta porque es estúpida,” or something similarly insipid. That does not count as a valid opinion! In an ideal world, a class discussion bubbles up from student opinion. I then go around the room and ask each student to say a word or phrase they heard in the song. This is quick. We then re-play a portion of the video, audio only, and follow along with the lyrics in Spanish. I just Google “letra” and the song title to find the lyrics online. Be careful – some lyric sites are better than others in terms of commitment to Spanish grammar. The repetition of the listening comprehension with the added benefit of reading along with the lyrics can create some neat “a-ha” moments when students put two-and-two together, or when they can confirm they heard the right thing. Nicely validating for a language learner! We usually listen through the first chorus at which point I’ll stop, and we try to translate what we’ve heard as a class. This is a great time to discuss word order, idiomatic expressions, slang, and any grammar topics you might currently be learning that appear in the lyrics. Sometimes even vocabulary words pop up. Depending on your students’ level of interest or your desire to get a discussion going, this whole process can take anywhere from 10 minutes to the entire class period. I’d say we average about 20 minutes for M.M. Pick a song for its cultural reference or repetition of a certain grammar topic and really prompt students to listen or look for that specifically as you play the song. Examples: “Hasta que te conocí” by Juan Gabriel to mark his passing at the beginning of last school year; “A Dios le pido” by Juanes for subjuntivo; “Volveré” by Jesse y Joy for future tense; “Ya no sé que hacer conmigo” by Cuarteto de nos for A LOT of preterite verbs. Give a prize to the student who hears the longest word, longest phrase, the most words, or the answer to a comprehension question you create based on the lyrics. In the fall of 2016, we took the entire middle and upper school on a field trip to see the Hispanic Flamenco Ballet, a traveling dance group that performs traditional Spanish and Latin American dances for school audiences. I used M.M. in the weeks leading up to our trip to introduce the different styles of music we would encounter (and we even learned a few dance steps). There are lots of great video tutorials on YouTube to choose from for this purpose. Let your students be the DJ! A culminating project for my seniors this past year was M.M. : ¡Te toca! With a partner, they prepared and presented an entire M.M., from picking the song, to creating the slide, to leading the discussion. Check out my TpT page for a free download of the assignment and rubric. As a “welcome back” activity, ask students at the beginning of the year to research songs in Spanish and make suggestions for future M.M. Throughout the year, I add our M.M. songs to a public playlist on YouTube. If students are working independently, I ask “¿Quieren escuchar a música en español?” and we rock out to our M.M. playlist. Some M.M. picks have even made their way to being played during the Senior Halloween carnival and varsity basketball workouts. No better feeling than when a student tells me they’ve been listening outside of class. Check out our playlists from the past two years and happy listening! *(Warning: not all videos are appropriate for school viewing or all ages of listener. Use your best judgment). The school year is coming to a close and many schools are still looking for qualified Spanish/World Language teachers. Below are a few openings with many others posted at Cerra. If your school district is looking for a Spanish/Portuguese teacher, feel free to send your openings to Trixi at sra.derosadavis@gmail.com for posting here. Feel free to share these openings with others. For the rest of us, let’s explore some ways we can maintain our second language skills! When I first became interested in learning Spanish, I used to watch VH1 (“bay-otcheh-uno”, the español version) all the time. Eventually I’d have some favorite songs and artists, and would run to the store to pick up their CDs (I KNOW! CDs!). I’d memorize the lyrics and look up any words I didn’t know to figure out the song’s meaning. This was such a great tool for learning, and for practicing pronunciation too! The grammar, vocabulary, and context would often present itself in later real life conversations, and just click. What I found most surprising about this practice was that after a car ride of singing along with some of my favorite Spanish music, my mouth would be so sore from working muscles I didn’t normally use in English! That’s got to be a sure sign that it’s doing something for your pronunciation! And I’ve had numerous conversations where people were surprised to learn that I wasn’t a native speaker; thanks VH1! Now there are all kinds of music streaming apps like Pandora, and, my family’s favorite, Spotify. We can use these apps to keep our international music on in the background and immerse ourselves in our second language while our everyday lives truck on! Eventually familiar songs will pop out, and you’ll be singing (and maybe dancing) along in no time! Search for foreign movies and shows on streaming services. Can you remember life before Google and TV streaming services?! These days you can easily search Google for “Spanish (or Portuguese!) shows on Netflix/Hulu/Kodi (You pick the app too! )”, and get a comprehensive list of shows and their descriptions! If you’re like me, your TV time is minimal, and usually shared with someone who isn’t interested in watching a Spanish movie. (Ugh!) When the rare opportunity to watch whatever I want presents itself, I like to make the most of it and really indulge my interests. Audit classes at the local college or university. Attend church services in the language. In my community there are churches that offer services in Spanish. Ask around! I have visited a friend’s church many times, and really enjoyed their all-Spanish praise and worship, and service. I’m also Catholic, and the Catholic Church on the other side of my town offers misa en español as well. This allows one the opportunity to meet and connect with a community of Spanish-speaking people which can potentially lead to a number of language experiences. One thing you want to remember when meeting new people is that it’s important to establish those relationships in Spanish! I have a few Spanish-speaking friends with whom I converse in English! (Boooo!) It’s a strange thing how hard it can be to make the official switch from one language to the other! Work part-time in the language. When I was a college student I spent time working for a local insurance agency geared toward my local Hispanic community. Aside from one of the co-owners, I was the only native English speaker on staff. The learning and practice I gained from this employment has been unmatched in my other language adventures! As a single mother, semesters and/or years abroad were not an option for me. Instead, I spent most of six days a week submersed in the language for a year and a half before returning to education. I often think it would be amazing to work in a Spanish-speaking environment again, and consider this when I’m visiting Spanish-speaking businesses. If it’s something you haven’t done before, I highly recommend you give it a go! Imagine everything in your current work place, but in your second language – language, friends, culture, experiences, AND money – win win WIN! But it isn’t always about money, right? I mean, we are teachers. Volunteering is another way to improve language skills. A Spanish-speaking friend of mine spends part of her summers off working as a volunteer at a summer camp geared toward Spanish-speaking children in her community. I also entertain the idea of offering English lessons to native Spanish-speakers. Basically anything that gets you involved with the Spanish or Portuguese speaking community is a win in my book! Opportunities to use your second language skills don’t always come easy; sometimes you have to seek them out, or create them! As teachers, many of us are afforded the summers to do our own thing. What better way to spend them than reigniting the passion that attracted us to our language studies in the first place? So go out, make connections, and get creative! ¡Diviértate! My challenge as a foreign language teacher and learner is to generate strategies that help students succeed in the language learning process. My personal experience shows students that it is possible to learn and to communicate using the target language. However, when I first entered a classroom in the USA I started to wonder how to keep my nature, how to motivate students to appreciate my culture and language, and how to cultivate diversity in the classroom. As a cultural ambassador I tried to find strategies to share my culture beyond the stereotypes in such a way that teenagers did not perceive me as “corny”, “petty”, or “weird”. Gardner (2016) stated that when dance is introduced in the classroom it is a celebration of language, culture, and people. The author added that dancing gave students an authentic context to interact, be engaged, and actively participate. Dancing is a big part of my heritage and I love it. Students are curious about the rhythms, but a simple video would not raise the amount of motivation teenagers need in order to get up and dance. I decided it would be fun to teach students how to dance and to review language concepts at the same time. Let your teacher know you do not have your notebook or book here because you forgot it in your locker. There is a new classmate. Introduce yourself and ask her three questions about his/her family. Let your mother know what you did in Biology class today and what your homework for tonight is. Tell your new friend what you and your siblings like to do over the weekend. The situations are created based upon the grammar and vocabulary we are studying at the moment. Students have 1 minute to put their ideas in order and to discuss how they would address the situation. After the minute I ask one of them to report what they have agreed upon. Thus, students are expected to discuss, share, and work together. All three students have to be ready to share with the group because all three of them lose credit if the language is not competently used. This is a great game for reviewing vocabulary, grammar, or cultural concepts. Students have the chance to collaborate and figure out ways to communicate their immediate needs given specific situations. It is a game, but at the same time it is enrichment of culture, folklore, and language. It is integrating music, the most authentic material, into the curriculum giving students the opportunity to explore and to spontaneously use language in a fun environment. Gardner, A. (2016). The case for integrating dance in the language classroom. Retrieved from http://www.csctfl.org/documents/2016Report/4_Gardner.pdf. As the time for signing contracts and determining plans for next school year is upon us, many school districts are searching for qualified World Language teachers. Below are openings that have been shared, some even include signing bonuses! If your school district is looking for a Spanish/Portuguese teacher, feel free to send your openings to Trixi at sra.derosadavis@gmail.com for posting here. Feel free to share these openings with others. Over the past decade or more, professional jargon such as self-directed learning, individualized instruction, and personalized learning have been at the forefront of the educational shift taking place in the United States. But what good are terms like these if we don’t have some practical ways in our teacher toolboxes to implement them? One way that I’ve found to be simple yet effective, always my combo of choice, is by incorporating student reflections. With experience as both an online educator as well as in the brick and mortar classroom, I have found the use of student reflections to be an effective tool for gathering data to improve my instruction as well as for students to improve their learning. A student reflection is a document I first encountered in Linguafolio, a proficiency-based, learner-directed portfolio tool to help students set and achieve language goals. I immediately loved the idea of having students pause and reflect on not only what they have learned how to do in a language but also how they learned it. The student reflection that I have adapted from that for my classroom is made up mostly of simple, open-ended statements for students to pause and think about. The statements are designed to give me information I need to improve my instruction but more importantly, I want students to be able to see patterns in their learning and areas that require further practice. What I have learned about how I practice or learn Spanish best is…. I feel __________________ about my progress in Spanish because…. In the online classroom, our team has revised the student reflection statements to reflect the indicators from the SC World Language Standard related to our lessons. This has helped to ensure that we are in fact meeting those indicators and that students are progressing towards proficiency in them. In some cases, it has allowed us to see areas where additional practice is needed in the design of the course. We have also added in some checks for understanding of online procedures and practices that are instrumental to their success. I can ask a few simple questions about someone’s family? (a) Yes, I can do this easily and well. (b) Yes, but I still need a little help. (c ) No, I can’t do this yet. At the end of a unit, students will complete their reflections as they look back through their work and achievements. Then, in the brick and mortar classroom, we take a few minutes to popcorn out some of their responses, make final revisions, and then I meet with them one on one for conferencing (another invaluable tool). In our conferencing, we discuss their status in the course, their answers to some of the reflection statements, and record a plan for improvement. Student reflections are kept in the classroom file cabinet and have been a valuable resource on occasion during parent conferences. Not every student gains something from this process, but most do. And, I can honestly say that I always learn something either that I can improve or something about the student that helps drive my instruction for the future. Shouldn’t that be the point of all that we do? A teacher shortage plagues our state and many schools and districts are unable to offer languages due to these shortages. Sometimes, it can be difficult navigating various district webpages to find available positions. If you learn of a district or school that is seeking a Spanish and/or Portuguese teacher, please reach out and share with us. Email Trixi at Sra.derosadavis@gmail.com, so that we can feature your school or district. The transition from typical classroom instruction to incorporating technology can be challenging. But there are some great tools out there to help you get there! As a teacher of Intermediate level kids (5th and 6th) I use these tools in a variety of ways. Below are just a few tools I use with my students that I find helpful. Are you having pesky issues with those PDF files that you have made of your scans from those old workbook sheets? Give Kami a try. It will give you the power to modify a PDF file and allows us to do “handouts” in a new way. https://web.kamihq.com/web/viewer.html (Opens in new window) *This can be added to google chrome as an add on. As language teachers, we’re all uniquely tuned in to current events and authentic texts in our target cultures. Between Shakira’s bilingual tweets and Snapchat’s feature videos on human towers in Spain, there is definitely a wealth of information available to our students that was perhaps not so readily accessible to us when we were in school. Yet sifting through all that’s out there can be a challenge, especially when it comes to music – that great universal language! With so many different genres, artists, and movements to choose from, how do we reach each of our students’ unique musical tastes and differentiate appropriately? For most of us it would be extremely time-consuming (not to mention impossible!) to accurately survey musical interests, preview and select appropriate songs, and find a way to somehow tie those songs back to course themes, recent grammatical topics, and vocabulary lists. While I’ve always loved using music to teach Spanish, it wasn’t until a few years ago that I realized I didn’t need to comb through the Latin Billboard Top 100 or research new Spotify playlists on my own. With a little bit of modeling and scheduling forethought, I could hand the reins (or better yet, the headphones!) right over to my students and get twice the interest level right out of the gate! That’s why in my classes, after a few months of introducing students to some of my favorite artists and their music (Juanes, Julieta Venega, Café Tacuba, and Bacilos usually make appearances), each student gets the chance to select and present a song of their choice to their classmates. They receive a presentation grade for their efforts, and a chance to move their song selection onto the March Music Madness bracket later in the school year. Song selections are treated as first-come, first-serve, no repeats allowed, enabling me to reward the students who volunteer to present first with the first shot at each selection. Given the popularity of Enrique’s “Bailando” or every Shakira song ever (just kidding! ), you might want to require your students to find and present a song that they haven’t heard before, or you can just grin and bear it when the third round of “Vivir mi vida” starts up in your third section. As a class, we also usually have a conversation before they sign up for their songs about what we will define as school-appropriate content, and I always reserve the right to veto if we aren’t seeing eye to eye. That became especially important since many of my students LOVE showing the music videos for their songs, and they don’t always have the most uplifting content. During presentations, students are required to introduce the song, artist, and country of origin, as well as to provide a lyric-based activity for their classmates, and some kind of follow-up questions to get everyone engaged. Some of them choose a traditional approach with a fill-in-the-blank, clozeline-type activity. Others choose to cut out the verses and chorus and challenge their classmates to put the song together again while listening. A few choose to ask their classmates to put the lyrics into their own words, or discuss what elements they would add if they were directing the music video. One time, a very sweet, zealous young linguist actually learned her song and sang it for all of us! Depending on what level you teach, you can easily tweak the minimum requirements for this kind of student interest-led presentation. Once everyone has had a chance to present their song, we vote as a class on both the songs presented earlier in the school year by me and the songs each student presented. The songs that we decide make the cut or the “play off’s” move onto our March Music Madness brackets, which we fill out on Friday’s during March. Since I started teaching this mini-music unit a few years ago, I’ve realized how many teachers have their own variation on this activity. There are all kinds of brackets available online, ranging from several TeachersPayTeachers sites with brackets of year-specific songs to a free bracket with 16 different Juanes songs and everything in between, but I prefer to use a completely blank template, like the one attached. It’s nothing fancy, but it gets the job done and allows me to quickly and easily create different brackets for different class sections. The good news is that since we’ve already listened to the songs on the bracket in-depth earlier in the year, it can be a quick and fun Friday activity to refresh their memories about what each song is about and sounds like, and move right into voting. It also creates great camaraderie among the students as they quickly begin canvassing for their favorite songs, arguing about which one should win or should have won, and guessing final outcomes together as the bracket takes shape. Ultimately though, it’s just another great way to introduce your students to something new in the target language, and get them talking, writing, and interacting accordingly. And that, my friends, will be music to your ears no matter what! If you have any questions or if I can help you in any way, please email me atrbogan@greenville.k12.sc.us or call me at 864-355-3105. I ask and encourage you to participate in this rewarding activity, both for you and for your students. Fast forward to 2016: now a co-sponsored program between the College of Charleston’s and The Citadel’s chapters of Sigma Delta Pi, our S.C. Spanish Teacher of the Year now enjoys its 12th annual contest, and on November 10 we will crown our 12th annual awardee. But as always, we rely on you to help us emphasize why teachers of Spanish matter: ensure that our outstanding K-12 educators of Spanish are nominated by the September 14, 2016 deadline. The official, downloadable nomination form and related details are found atwww.scspanishteacheroftheyear.org. Let’s make our 12th annual contest the most successful yet, and thanks to all our K-12 teachers of Spanish in the Palmetto State for preparing our youth for the world that awaits them. The answer varies from program to program, and it certainly varies from a traditional brick & mortar approach to language learning. Teaching a language online is often more challenging when it comes to interpersonal and sometimes presentational tasks in the language. However, offering language courses online can be beneficial to students. Many students consider speaking into their computer, rather than standing and speaking in front of a class, to be the greatest benefit of an online language course, but there are other benefits as well. In some cases, taking a language online might be the only way that a student can take a language if it isn’t offered at their school, or it won’t fit into their schedule. By offering languages online, we are able to reach more students with greater course offerings. Communication, Communication & Communication! Clearly communication is important in any online course, but especially in a second language course where students may be trying to learn how to navigate a course as well as learn a second language. Make sure that directions that are related to the navigation of the course are presented to students in their first language. Ideally we want to use the target language as much as possible, but students should be given instructions on how to move within their course in English. I also suggest that teachers find multiple ways to communicate with their students. I tell my students that I will communicate with them in any manner they are comfortable, whether that is Skype, email, text message, or emojis. ☺ I send out weekly messages in at least 2-3 forms of communication so that students have access to the information in several places. Create a Community – Get everyone involved! Whenever possible get parents involved in their student’s learning. Don’t wait until a grade drops or students fall behind to contact parents. Encourage students to get their parents involved with them in learning a new language. Offer suggestions on ways the entire family can get involved in learning the language and culture, such as eating at a restaurant, shopping at an authentic grocery store, or learning a new dance. Give good feedback! In an online course, giving good feedback is crucial to student growth. One of the strengths of online courses is that students do receive some immediate feedback in activities. Make sure that this feedback is well developed and encouraging. Feedback for assignments should not just include corrections, but explanations of errors. When applicable, I include a screencast with my feedback or an audio response using screencast-o-matic.com or vocaroo.com. Add an APP! Finally, in addition to coursework, suggest that students add an app to their phone that will encourage additional practice of the target language. Students are much more likely to practice the language in their spare time if they can access it via their phones. Teaching a language online is extremely challenging, but can be very rewarding for students and teachers, plus it’s a great way to spend time in your pajamas! Keep the energy up! You have to remember, they are still kids and thrive on energetic and passionate teachers. Standing at the front of the room and just going on and on will do nothing to inspire learning and creativity in these young minds. Build relationships. While this is true for any level, these middle school kids are generally confused and emotional, hormonal drama factories. I do the best I can to greet each child with a high five, handshake, or a quick ‘pound it’ as they enter, and make a point to learn as much about their lives as I can. Play Games and competitions! I’ve found that younger kids enjoy competitions and language games more than older students. Whether it be playing Kahoot! Or Quizlet Live to review concepts, or writing/speaking competitions, the kids thrive on competition (keep it civil!) and are learning language at the same time. Stick to the target language. ACTFL suggests 90% target language use, and this is especially important for younger children. Their brains are more receptive to language acquisition (I suggest reading up on Chomsky’s Critical Period theories if you are not familiar with them) at the middle school age (compared to high school), meaning they’re much more likely to soak up and retain the language. After all the main focus of class time is comprehensible input! Use gestures/act things out! Many times, in order to make myself understood, I’ll use gestures and generally look insane to get the kids laughing, but also understanding what I’m saying without having to dip into English and tarnish the target-language environment that I’ve created in my classroom.